Whether you’re new to exercising or a seasoned athlete, a woman’s monthly cycles can sometimes impact your exercise routine and personal goals. Knowing our bodies and how our hormones change throughout our cycle is a great way to plan ahead and decide what types of exercise we should perform, and when. This way we maximize our results and use these changes to our advantage. Females of reproductive age experience cycles of hormonal activity that repeat at about one-month intervals. With every cycle, a woman’s body prepares for a potential pregnancy, whether or not that is the woman’s intention. The term menstruation refers to the periodic shedding of the uterine lining (“menstru” means “monthly”). There are four major hormones involved in the menstrual cycle: follicle-stimulating hormone, luteinizing hormone, estrogen, and progesterone. Starts the first day you get your period and lasts until you ovulate. During this time the follicles in your ovaries are maturing. The menstrual phase may last for the first two to seven days (depending on the individual), during which time your body sheds blood and tissue from the lining of your uterus because there is no pregnancy. On day one, estrogen is at its lowest level and slowly increases to stimulate follicular growth. The follicular phase lasts for about 14 days. A mature egg is then released by the ovaries and becomes available to be fertilized by sperm. 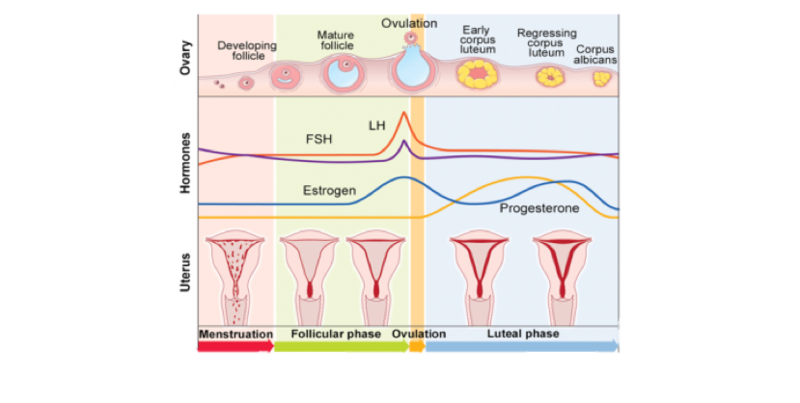 Estrogen and Luteinizing Hormone (LH) are highest on the day of ovulation. Progesterone starts to increase, and body temperature also increases. Starts the day after ovulation until the day you start your period. In this phase, the lining of the uterus begins to thicken to prepare for a possible pregnancy. During this phase, Progesterone, estrogen, and body temperature increase, but then start to decrease if the egg is not fertilized. This phase lasts approximately 14 days and the cycle starts all over again if the egg is not fertilized. If you are a female of reproductive age and regularly get your period, you may notice that you feel more tired, less motivated, and potentially weaker around certain times of the month. This is because along with normal hormone fluctuations, training-related factors such as metabolic rate and strength are impacted. Menstruation: Even though we don’t always feel up for strength training during this part of our cycle, this is not necessarily a time when our body needs to rest. Our body temperature, insulin sensitivity, and metabolic rate should be at “baseline” during this phase. Continue training as normal, if you feel up to it. Follicular phase: This is the phase for training hard because of your higher testosterone levels. This increases your chances of increased muscle gain and strength. You may want to plan your heaviest, most intense strength workout routines during this phase. You may even notice that you have a higher tolerance for pain during this part of your cycle. Your metabolic rate may be a little lower during this phase, resulting in a slight reduction in energy expenditure at rest than usual. But this shouldn’t cause any differences in your training. Ovulation: The second part of the follicular phase, leading into ovulation, may be a good time to perform maximum strength training. However, your risk of injury may increase due to an increase in estrogen. Take precautions and warm-up properly before starting an intense workout. Luteal phase: After ovulation, the luteal phase may be a good time to reduce intensity and get adequate rest. Due to your already increased body temperature you may feel tired or fatigue more quickly, reducing your overall athletic performance. However, your metabolic rate may be higher during the luteal phase and therefore you may use more calories at rest than during the follicular phase. Your insulin sensitivity may also be lower, so foods with more healthy protein and fat rather than carbohydrates may be a better option. It’s also possible that during this phase your body may use more fat for fuel due to increased progesterone and decreased estrogen. Did you know that inactive adults experience a 3% to 8% loss of muscle or lean mass per decade? This is accompanied by a reduction in resting metabolic rate and increased fat accumulation. 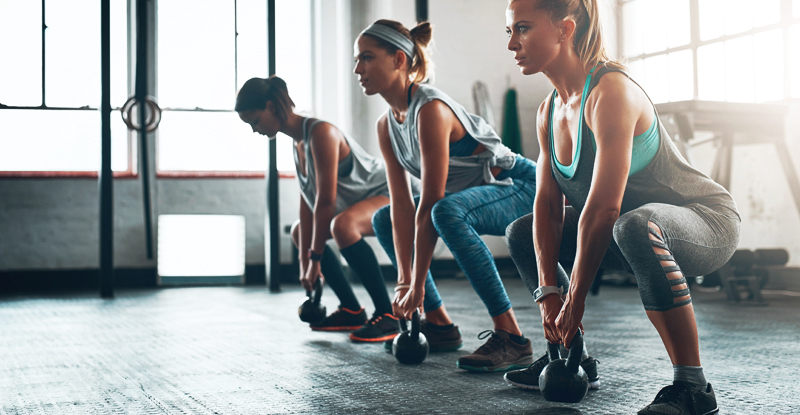 Studies have shown that just ten weeks of resistance or strength training exercise may increase lean muscle mass by 1.4 kilograms, increase resting metabolic rate by 7 percent, and reduce fat mass by 1.8 kilograms. New to strength training? Check out Strength training for beginners. Or hesitant to try strength training? Check out 3 Myths About Women and Weight Training. If you’d like additional information on specific exercises or exercise routines, you can check out the American Council on Exercise’s Exercise Library for information and instruction. Tracking your menstrual cycle can help you understand how YOUR body is affected by these hormonal changes, and then plan your exercise routine so you can still achieve your health and fitness goals. Tracking your cycle has never been easier with free mobile phone applications and websites designed to do just that. But the old-fashioned paper calendar works as well. In addition to tracking your cycle, you can also measure your basal body temperature. Take your temperature as soon as you wake up—your readings will be lower during the follicular phase and then peak after ovulation. Your basal body temperature will remain higher throughout the luteal phase into menstruation. Literature on oral contraceptives and strength training conclude that if you are using oral contraceptives or the patch, you are not likely to experience all the hormonal fluctuations stated above. When using oral contraceptives or the patch, you can expect levels of estrogen and progestin to be steady throughout your cycle, rather than the peaks and dips described above. Depending on the person and the oral contraceptives or patch used, a steady hormone level may affect muscle gain or fat loss when compared to someone who is not using these medications. Oral contraceptives may also cause an increase in insulin resistance, but this should not impact training sessions. At times some women may experience the loss of their menstrual cycle all together. This condition is called amenorrhea. This is normal before puberty, after menopause and during pregnancy. If you don’t have a monthly period and don’t fall into one of the three categories listed above, you may need to discuss your menstrual changes with your health care provider. Amenorrhea can sometimes be a result of low body weight/fat, excessive exercise, or medications. Additionally, problems affecting the ovaries, hypothalamus, pituitary gland, or thyroid may cause secondary amenorrhea. Talk with your provider if you are experiencing a loss or delay in periods regularly, as something more serious may be going on. Some athletes or physically fit women may view amenorrhea as a sign of hard, intense, or successful training sessions. Some accept it as a solution to a monthly inconvenience, and some may not even stop to think of the consequences. Missing your menstrual periods is often a sign of decreased estrogen levels, which can lead to osteoporosis (a disease in which your bones become brittle and more susceptible to fractures or breaks). Usually osteroporosis affects older women, but some younger women who exercise so much that their periods stop can develop this condition at a very early age. Some female athletes in their 20s have been found to have the bones of an 80-year-old woman. Overtraining can also lead to decreased athletic performance, a reduced ability to exercise or train at the desired levels of intensity or duration, and an increased risk of injury. Remember, strength training and exercise are a good thing, but too much of any good thing can be bad. Hormones are “chemical messangers” that move through the circulatory system and stimulate specific cells or tissues into action. It’s important to recognize that everyone’s body is different and requires us to transmit different hormonal messages. The types and levels of hormones fluctuate and can vary person to person. Always consult with your provider if you have questions or concerns about your menstrual cycle and/or your training and exercise routine. Irregular menstrual cycles may be common for some women with a diagnosis of Polycystic Ovarian Syndrome (PCOS), Endometriosis, Uterine Fibroids, or thyroid problems. These and other conditions may make exercise more difficult as your cycles vary from month to month. Be patient with yourself. If you don’t feel like doing a planned workout on a specific day, it’s OK to change things up. Creating additional stress by forcing yourself to do an intense strength training session may cause more harm than good. Remember why you are exercising to begin with and listen to your body!